We have a category of common exercise misconceptions. We often talk about exercise myths. The magic of testosterone is always in every male's fitness word repertoire but yet we don't talk about the basics of exercise. One of the basics is how to avoid neck strain for abdominal crunches. Yes, HubPages will be mad at me because abdominal are over exposed in the world of blogging. Yet, where is the guidance on how to avoid neck strain during crunches? Well, here it is whether the Google Gods like it or not. This is an important topic and we must address it. Why am I passionate about this part of exercise? I have problems with three of my cervical discs. I have visited five - count them five of the world's leading surgeons. Yet, I have not had surgery. Why? The surgery for the neck is even more sensitive than back surgery. Cervical discs lead - you guessed it directly to the brain. Was physical therapy recommended for me? No. Was I trained in all my certifications for fitness about avoiding neck pain? To some extent but not specifically. Did I train myself? Absolutely. The trite saying of the "Mother of All Invention is Necessity" is very true. For you see, I left one career that I loved due to paralyzing pain in my right arm. This pain was caused by a prior car accident. So I know the pain first hand and have spend years of my life fighting against this pain. For far, nine years later, I am relatively pain free. I am very careful - always of my neck. I sleep with a special pillow. I travel with my "special pillow". If my pillow is forgotten (I am human after all, I use a towel for a substitute). So what did the top doctors in the world all recommend? Surgery. Interestingly, Mayo Clinic was the only one who took a different approach - a more proactive approach to address the entire cervical column rather than the three discs that were causing the numbness. I am living proof, surgery is not always needed - at least not right a way. Will I once again need surgery and go through with it - absolutely. Age has a way of catching up with all of us. But for now I live a healthy life and wish to share with you my journey in order to help you out of your pain. Of course, the best case scenario that would bring me the greatest joy is for you too, to be able to avoid surgery for close to a decade and hopefully beyond. Have You Ever Experienced Numbness and Tingling In your Arms or Legs? How Did I Avoid Neck Surgery? I studied, I researched, I visited all the right doctors. None of these things "helped". Exercise helped. I turned to my beloved swim fitness. I now had an excuse to be in the water! And I now had the time to develop a lifelong dream - my swim board. But this article is not about my invention, this article's purpose is to help you avoid pain. The swimming pool, the warm waters of the hot tub may not for you - I can still lend you some assistance. Respect the curve of your neck. Sleep, travel with an orthopedic pillow. Roll a towel up and place under your neck if no orthopedic pillow is available. Always fly with a pillow or jacket behind your neck. 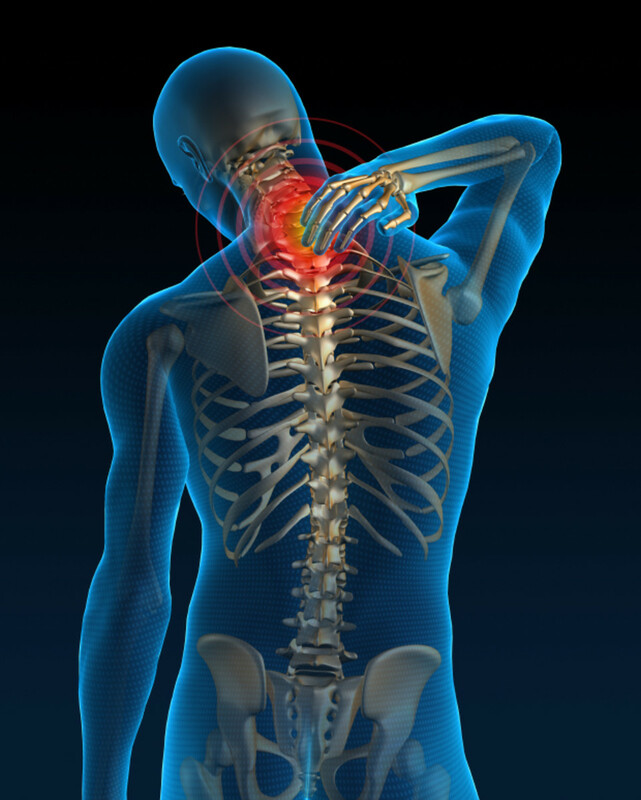 Recognize neck injuries do return long after the car accident. Don't give up on crunches - learn how to perform them correctly. 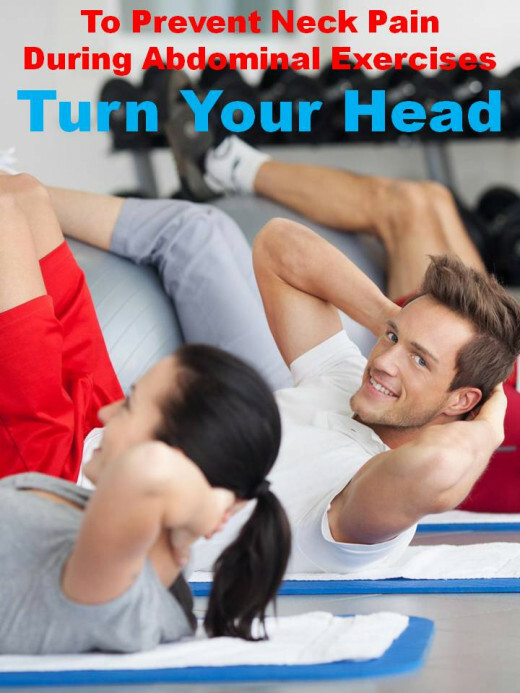 Turn your head to the side when performing crunches. If so, where was your pain? While I avoided surgery, I never avoided my doctor. My physicians were superb. They recommended surgery - it was my personal option not to choose surgery. Consult with your physician but remember, you are the driver completely in control of your health. And this part is critical, your health is more than what our society has determined as "health". Our bodies are made to heal themselves. Our muscles can grow stronger, our resting heart rate can become more efficient and we have the ability to care for the cervical discs in our neck. If your neck pain extends to the nerves, you may feel numbness and tingling in your arms perhaps extending to your fingers. The numbness and tingling in the arms is a direct parallel to the numbness in the legs that back patients feel. Both arise because the discs are affecting the nerves. Back nerves hit the legs and neck nerves hit the arms. For many of us flexing our neck is a natural reaction during many of our exercises but especially for the crunch. If you catch yourself flexing, some people recommend picking spot on the ceiling and concentrating upon that. I recommend turning your head to the side - this reminds your neck not to flex. We need to protect the discs both in our back and our neck in order to prevent pain. If we understand our anatomy and yes, we are probably worst at anatomy than even geography in our educational system. With today's technology and ability to see the medical diagrams, there is no reason not to understand this basic of anatomy. We must understand anatomy in order to properly drive our body. We wouldn't hop in the car for a 300 mile drive without a map? So why would we start exercising and not understand the road map of our body? We don't have to learn the Latin terms, we don't need a PhD. but we do need to know what is inside of us and what precious gems we need to protect. We all know the location of the brain and the heart but did you know about the discs in your neck and back? Perhaps we do today more so than when I was young because today here in the United States we have the aging babyboomers. I don't want us to learn these items because we age, I want us to learn these items for are basic health when we are young. For you see, if we start when we are young learning the basics of exercise, we can grow old gracefully and avoid pain and for some, we may even be able to avoid surgery for a decade or more. Rebecca's video on ab and oblique exercises is right because it has proper form for the crunch (no interlocked fingers), but she also provides a variety of different exercises all with proper form and breathing. The only thing I would add is to breathe in through your nose and exhale through your mouth. The exhale is just as important. Note, during these exercises she is often turning her head to the side - this will serve to avoid neck pain. Also, note, she reminds us exercise alone will not make us health - we must also eat right. This exercise video is also great because she moves quickly through it and is also actively working her heart and lungs. Roll up a small towel and tuck under your neck. This will provide the right about of support for the cervical discs in your neck. If you find you love this trick, you might wish to invest in an orthopedic pillow. Somehow my household now has four of these and I could not sleep without them! Preventing pain, preventing neck strain is just as important as exercising daily and eating right. We must learn the road map of our body and understand the discs that allow our neck and our back to flex and move us forward. If we take the time to learn, exercise daily and eat right, we will be healthier and being healthier is the foundation for GREAT happiness. How to Prevent Sore Muscles. Ways to Avoid Muscle Pain from Exercising. Fellow gym rat - love that title - I wear it proudly! Thank you! Great hub, this is really a good way to help your neck. Think about how much pain you will be in from straining your neck when you are older. This is very helpful for gym rats such as myself. The pleasure is all mine. Anything that helps others avoid pain, I am honored to be able to contribute. I struggled with debilitating neck pain so this subject is near and near to my heart. Helpful and healthy tips. Thanks. Thank you so much for stopping by and contributing. It really means allot. I do hope others take heed and never experience the neck pain and numbness in their arms like I did. The exercises, the orthopedic pillow (or a rolled towel when I am traveling and stuck with the hotel pillow) have alleviated most of the pain. Living differently and exercising more is the key for me to be pain free. Thank you so much for the continued support. I too hope I never have to have surgery. It is not like me to not take the physicians recommendation but delaying it felt right in my heart of hearts. Today strangely I noticed two people wearing neck braces when I was running my errands. Sadly, I believe neck strain is becoming more prolific than back strain. I learned this trick when I was in swim fitness. For some reason, I never translated it to land and then the aha moment when I was training on land came and I realized I was straining my neck. One of the new exercises that I am anxious to try is the oblique twist with the TRX system. You might wish to check out this movement - my TRX Poster hub has a video that demonstrates that specific movement. Neck strain is very painful for me so I must be very careful - that and my knees. Excellent article about the importance of protecting the neck during crunches, thank you. It is obvious you have spent a lot of work compiling this hub with useful information, both personal and practical. The use of videos is especially helpful. Rated UP/U/I Thanks! This is some wonderful and first hand advice regarding avoiding neck strain. Hope you never do have to undergo surgery. It should ideally always be a last resort. Giving this a tweet and will also pin this to my health board. That's some awesome tips there. I always end up having neck pain whenever I use the abexerciser machine. Because of this, I have now abandoned the machine. Neck pain can be debilitating. It is amazing what our body can take and what can stop us in our tracks. I believe all pain is a sign from our body that we must make substantial changes to our lifestyle and include exercise not just for stress relief but for strength for our muscles and for our heart and lung muscles. Bypass surgery is a life changing and life giving operation. So glad surgery was able to help but even happier that you have taken control of your health. Blessings to you and your family. We do need to include exercises in our lifestyle. We do need to include instruction about exercise. I sincerely believe alongside the ABC's we teach our children, we must add the fact that muscle protects our joints and is the only thing that ensures our continued mobility. Neck pain is a horrible condition. Thank you very much for the tips and suggestions for keeping the neck safe, Easy Exercise. Wonderful information. I love that you bypassed surgery and took control of your own treatment. Well done! You are so right. It is all about lifestyle. The "fast solutions" - what a great way to summarize our human tendencies. "Learning to live" is an even better set of terms - very well stated. Thank you so much for contributing to changing our paradigm of health! Thank you so much! I looked out on the world wide web and while there was some information, there was nothing comprehensive. We need comprehensive solutions not short blogs of tidbits. This is one of the reasons why I love HubPages - they encourage us to tell the entire story, not just the tidbits.Neck pain is horrible and to avoid exercise because of this fear is something that we must address. Turning the head to the side, I learned while attending an international aquatics conference and amazing the movement works beautifully on land but I have never heard this encouraged on land. 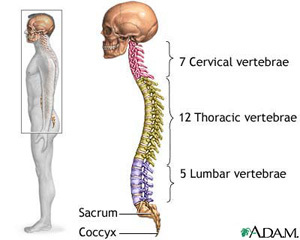 When you think about it - it makes common sense to turn our head to the side to protect the sensitive cervical discs. You made several good points. Surgery is in my opinion too often offered ad the only solution, but in reality many things can be done with proper exercise, what inevitably leads to the question about discipline. We seek for fast solutions instead of learning to live (and exercise) the right way. Thanks for all the tips.